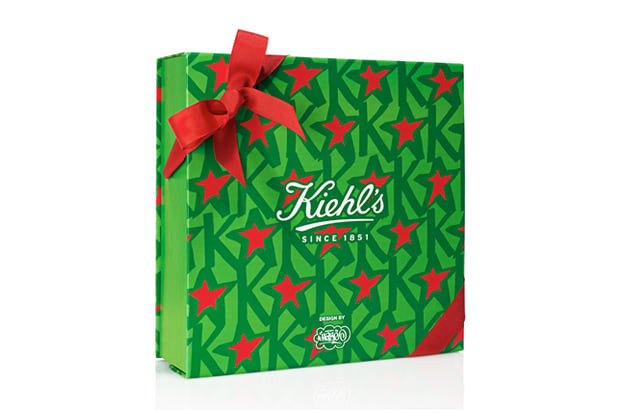 Continuing in their tradition of artist collaborations, cosmetics retailer Kiehl&apos;s invited Eric Haze to create custom packaging for products in their limited edition holiday collection. Previous collaborations with KAWS, Kenny Scharf, Jeff Koons, and Pharrell were well received by customers and we&apos;re sure the Haze collection will be also. Products including the Ultra Face Cream, Creme de Corps, and Creme de Corps whipped body cream feature custom artwork that incorporates stars, a "K" for the store, and Haze&apos;s logo. The Haze x Kiehl&apos;s collection is available now while supplies last.